Are you planning your wedding in the Royal Botanic Gardens? 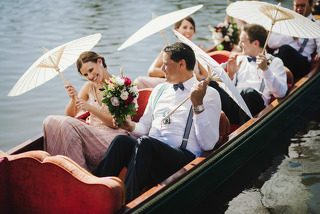 We have a number of Wedding Punt Cruise packages to enhance your celebration and delight your guests. Don’t leave your guests sitting around! While they await the arrival of the bride and groom at the Terrace Restaurant, why not provide short cruises on the Ornamental Lake? Guest of all ages will enjoy the diversion. Punts depart and return to the Punting on the Lake Landing in front of the Terrace, picking up and dropping off guests approximately every 20 minutes. This also gives your guests a wonderful photo opportunity. The perfect opportunity for just the two of you to share a romantic cruise around the islands of the Ornamental Lake before you join your guests. Departs and returns to the Punting on the Lake Landing in front of the Terrace. Photographers are welcome on your punt free of charge. 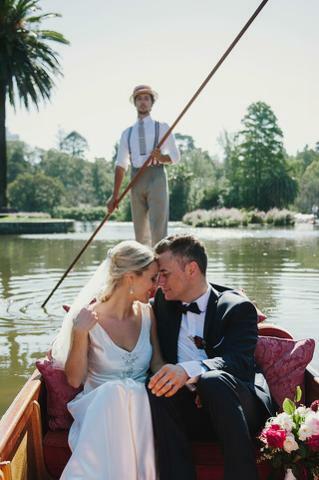 Our handcrafted wooden punts and the beautiful scenery of the Royal Botanic Gardens provide a romantic and elegant setting for your wedding photos. Our punter will follow your photographer’s directions for the shoot. Bookings are available online. If you would like to book a different time, different date, or have any questions, please call us on 0481 455 410.